House Speaker Nancy Pelosi, D-California, made a stop in the St. Louis-area on Monday afternoon to gather support for two key pieces of Democratic legislation. The trip was Pelosi’s first stop to Missouri since Democrats regained control of the lower chamber. 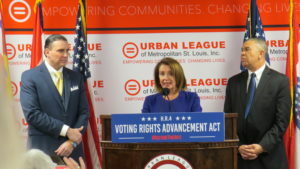 Pelosi joined Congressman Lacy Clay, D-Missouri, and other elected officials as well as community leaders at the Urban League Empowerment Center in Ferguson to rally for final congressional approval of two bills: HR. 1, “The For The People Act of 2019” and HR. 4, “The Voting Rights Advancement Act of 2019″. Both landmarks bills are part of what Pelosi calls efforts to restore ethics and government transparency. The proposed plans would expand voting rights and change laws about undisclosed campaign donations. “We are going to the heart of the Constitution of the United States – the right to vote, which our founders in their wisdom enabled the Constitution to be amended to do,” said Pelosi. Clay, a co-sponsor of both measures, stressed there is a lot at stake with the passage of this pair of proposals. “This is worth the fight and why is it that the other side don’t want these people to vote, to have a stake in their own government? Because they want to keep things the same,” said Clay. U.S. Senate Majority Leader Mitch McConnell, R-Kentucky, has criticized H.R. 1, calling it a “power grab” because it would make Election Day a holiday. Clay represents St. Louis and St. Louis County in the U.S. House.